Today’s consumers are on the move, and with mobile devices accounting for nearly 20 percent of site sales heading into the 2014 holiday season, creating compelling mobile experiences is no longer just a nice-to-have option. 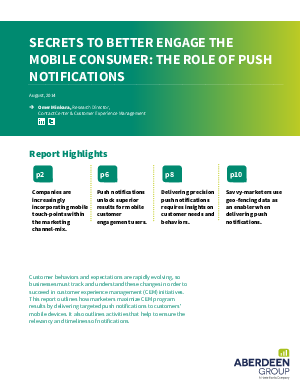 Read this research report from Aberdeen Group to get secrets on how targeted push notifications can generate unprecedented levels of engagement with customers wherever they are. Find out how to make sure every message they receive is relevant—and right on target.